Some days you just need to sit down and be obsessed with your favourite series. Look, I am subtle about my adoration for The Raven Cycle (well Stiefvater books in general). I only feature them in 93.2% of my photos and constantly reference them and reread them and make ridiculous headcanons. * But pfft subtle. I do think, though, that life is too short not to occasionally recommend your favourite books to everyone who BREATHES OXYGEN. We bookworms can get very self-conscious about our favourites. Will they be picked on if we release them into the wild? Will people think us weird for loving that particular book? Can we get away with mentioning it 99 times a day before death threats begin??? I don’t know, my fiends. But we should try. LITTLE CHILL IS TO BE HAD HERE. * IS RONAN TEACHING ORPHAN GIRL HER ABCS??? WHO BABYSITS HER WHEN HE GOES TO SEE ADAM AT COLLEGE?? DOES RONAN AND ADAM BAKE HER BIRTHDAY CAKES??? (1) I’m doing The Raven Cycle book tag which no one tagged me for but hey. I didn’t read the Dream Thieves without gleaning some sneak thief tips. In the books, Maura is the relaxed mom that is Blue’s friend more than an actual mother. Who is your favourite mom character? Ooh I think I’ll say that Becky Albertalli writes really great mothers! Usually YA contemporary is about awful parents * but both Simon Vs the Homo Sapiens Agenda and The Upside Of Unrequited have really nice mums?! They seem to actively notice what their smol children ** are doing and love them for who they are. Which is amazing, especially if your kid turns out to be a dragon or something. That has not happened. But it could. The next Albertalli book maybe?!?? * Um, yeah I just BURNED my own book with salt and fire but hey. My actual dream location is living somewhere close to a MASSIVE library. AKA this will have to be a city. The only problem, of course, is the fact I don’t like noise or people or noisy people. So like??? Can I live in an empty city??? I know most people are terrified of the zombie apocalypse but wow, mate, when everyone is exodusing — I will be settling into barricade myself in the library. I will be so happy. This visions is so lovely and not antisocial at all. I never read blurbs. I just make stuff up and then get mortally offended when a book doesn’t read my mind. I mix it up with another book because of similar titles / covers. It’s been pitched badly. Like The Scorpio Races was pitched as “just like the Hunger Games” back in the day. Ah…ahhh haha. Someone got into the eggnog and drank way too much. I’m just clueless and live in my own world and have no idea what’s going on. I am chronically confused. FOR ALL THE BOOKS I COULD EVER WISH AND HOPE AND DREAM FOR. * This is a horrible idea by the way. I cannot cook. I thought rock cakes had actual rocks in them. In this series you get to see Greenmantle as a fleshed out character but also as a villain. Name your favourite type villain. The morally grey misguided squid: little bit pathetic, probably will make your heart bleed, they definitely murdered someone and should be in prison, but also … aww. The irritatingly powerful nasty beehive: Basically ones like Umbridge who has power but who has little stinging tentacles everywhere and is hard to dislodge. Always there, “pretends” to be “good”, but you want to stuff their pink hat down their throat. The delightful psychopathic pie: absolutely bad and totally unhinged and will cut you up and eat your heart while laughing. See Sebastian Morgernstern and Moriarity. But you kind of can’t look away from this train wreck. The “SURPRISE, I’M EVIL” one: where you legit didn’t know it was the villain for sooo long. You smelt something off. But then BAM. Dark side. Usually includes huge betrayal and the narrator and you crying on the floor. I thought we was friends, mate. Blue’s got her Raven Boys. Who makes up your bookish team (4)? Well obviously the Raven Boys. And also Blue. Seriously sometimes you just read a book and you want to just FALL into its world. I absolutely want to live in Blue’s wildly messy and self-renovated house with a million rooms of weirdness too! 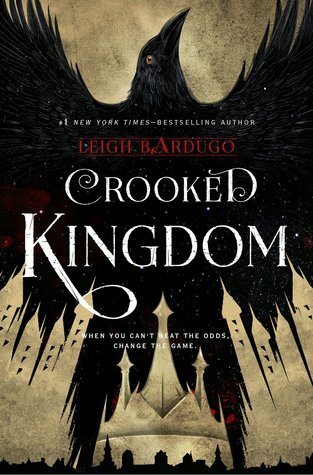 Honestly I think ALL good books should have this: humour + emotion + wild action scene with probably someone swallowing swords while the world is on fire + a smol corner where we all get to go cry. This is such a fabulous combination! What could go wrong! Here are some of my favourites that manage to make you shout because someone’s getting stabbed AND also pat your shoulder because someone’s crying. 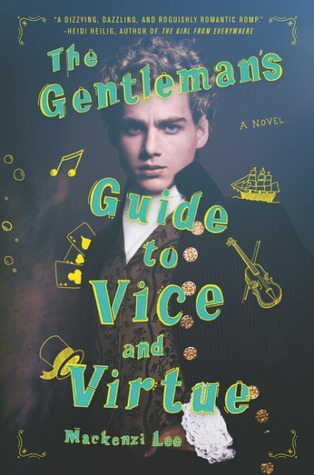 Gee, The Gentleman’s Guide is so not here to match the colour scheme is it?!? Thanks, Monty. Stand out, why don’t you. Noah has a heart of gold. Who has touched your heart recently? I actually ate a really terrific caramel and dark chocolate ice cream which…like WOW. Sometimes you don’t know what true love is until you eat something. I mean, not people. Don’t eat people. It’s not safe, they have weird bones. ALSO my heart is doing all these strange catastrophic flips while ARCs of my book A Thousand Perfect Notes are going out into the universe. I caaaan’t even with how excited people are being! AND I GOT MY FIRST LOVELY 5-STAR REVIEW. From a human who (a) doesn’t know me, and (b) isn’t my mother! So I don’t know! I might shout enthusiastically! Having your art appreciated is bessssst. I discovered I actually HAVE A HEART. You won’t when you read my book though haha hahah. Calla is a woman who speaks her mind and puts her foot down when necessary. Who is your favourite strong female character? Full disclaimer: I don’t like the term “strong female character” because the term “strong male character” DOESN’T EXIST. It’s like sexism is dancing in the streets here. But I appreciate the thought behind it: highlighting complex and interesting women! All the women in Fox Way LET’S BE REAL HERE. I want some pie from Persephone. Isabelle Freaking Badass Lightwood who is feminine AND terrifyingly excellent with weapons. Also Emma Carstairs because why not just fall on our faces in a moment of Shadowhunter appreciation. Mia from Nevernight who is, quite frankly, terrifying but also super funny. Puck from The Scorpio Races. I just fell over again and tipped STIEFVATER APPRECIATION everywhere too. Ugh I can’t help myself. But in my defence, I warned you this post would be obsessed. Anyway! Puck gets 500% mad when her brothers are lazy useless gnats and #relatable #content. I do have a dog and he is sort of a strange dog because he sits like a frog and acts like a cat. Me: Let’s go for a walk! Me: want me to pat you?!! Me: come sit on the bed with me! I’m wounded deep inside my soul. I have since adopted the fish in our backyard pond, who are more affectionate towards me than mY OWN DOG. Anyway. I would like a hedgehog! I would call it Paul. Also totally would be down to raise a small army of dragon hatchlings and teach them to follow me and call me mama. It’ll be great. 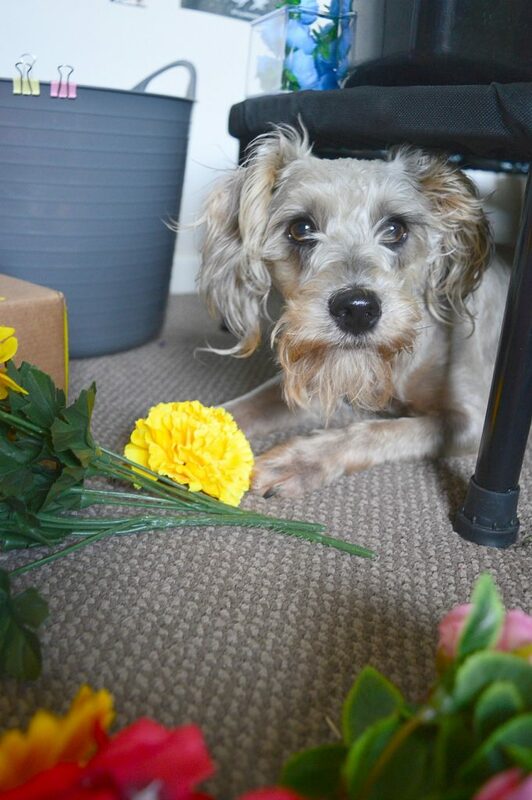 He also steals my flowers. I can’t even. ALSO…while we’re chatting like good friends…if you have any posts requests for me, I am so open to suggestions. Anything! Writing, blogging, booking, screaming. QUEST ME. 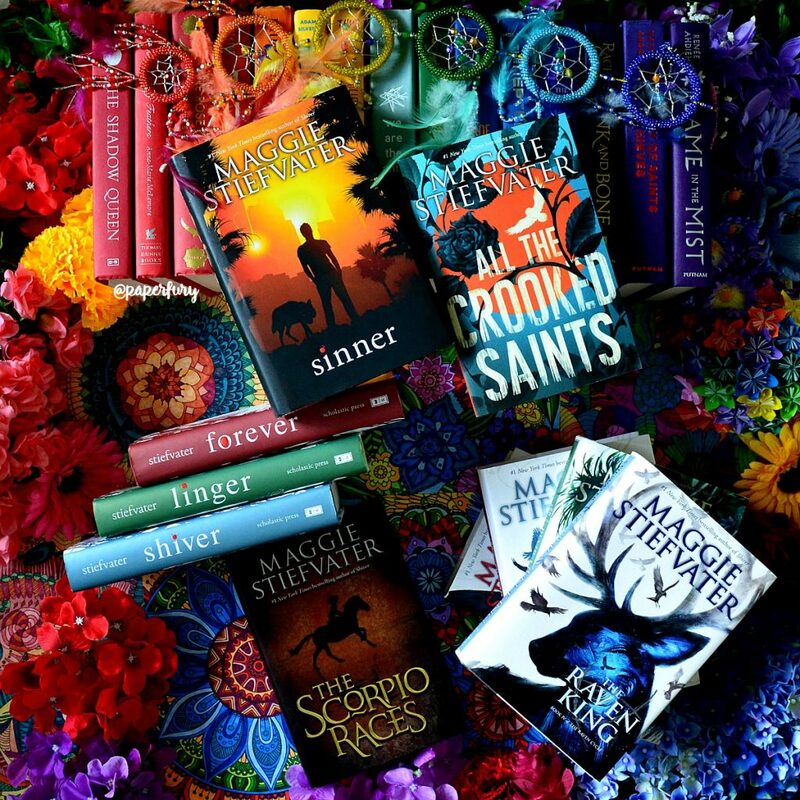 who’s your favourite Stiefvater character or book?!? (and please tell me you’ve read them omg) also what would you wish Glendower for?!? and do you have a favourite author you just never stop talking about?? Oh my gosh, your dog is absolutely ADORABLE. What breed is he? (Those EYES, OMG.) I’ve really been meaning to catch up on this series and read Stiefvater’s newest release, too. She’s definitely a super talented writer & I’m often in awe of her writing style. And I think they’re adapting the Raven Cycle books to TV? I think it could be awesome! I was JUST thinking about rereading The Raven Cycle!! THIS IS A SIGN! 😍 I sadly havn’t read the Scorpio Races, but I definitely need to! IT IS A SIGN. IT IS LITERALLY THE BIGGEST SIGN!! THE UNIVERSE WANTS THIS OF YOU!! IS IT JUST ME WHO THINKS YOUR DOG LOOK LIKE GANDALF OMG HE SO CUTE. This great tag reminds me, I forgot to tell you but I finally picked up The Raven Cycle in 2017 and that was 100% because of you, as I was a bit terrified going in and afraid I wouldn’t understand anything. (I’m more of a YA contemporary kind of girl okay??! Which means I’m dying to put my hands on A Thousand Perfect Notes, obviously) But let me tell you. It was as amazing as you described it. Like, okay, Cait is always right. I fell in love with the story immediately and couldn’t do anything other than read the four books back to back. This series is now one of my favorite series of all time. So, thank you so much for introducing me to these wonderful, spellbinding books Cait! My life wouldn’t be the same without them now. Okay, if the apocalypse ever happened, you’ll find me in a massive city library. Pfft, zombies can’t read. They won’t find me there. Perhaps we will run into each other! I think my one wish would be to STOP TIME so that I could read ALL THE BOOKS! Exactly, right?! It’s the PERFECT hiding place!! All we’d have to do is venture out to obtain food and then we could just hole up forever. Our TBRs would actually be conquered!! And honestly The Scorpio Races is irreplaceable in my heart. 😍 It was my intro!! And I’m still hopelessly in love with Thisby. HE IS CUTE even if he hates me.😂 And afjdskald I’m so jealous you’ve gotten to meet her and The Raven King was an AMAZING conclusion. I was so stressed though.😂SO STRESSED. Haven’t read them… but I bought The Raven’s Head last year and it’s on my list to read this year. I am constantly raving about Deborah Harkness and her All Souls Trilogy books, I do have many others but seem to rave about this series more especially because on the tv series this year!!!!!! I need to be catching up on my reading of book two right now ! EXCELLENT. AT LEAST YOU ARE ON THE RIGHT TRACK. *throws confetti at you* And ahh I love it when a favourite author never disappoints!! Wait, wait, The Serpent King isn’t fantasy? I’ve had it on my tbr because I’ve been assuming it’s urban fantasy. I totally agree about the term strong female character! I mean, I like what it means (to the point where I considered getting it tattooed on my arm, but, hey, PAIN), but I feel like people use it exclusively for non-feminine girls in books. And not that it’s a bad thing to be non-feminine, just like it’s not a bad thing to be super feminine, but often times those girls look down on people who ARE super feminine, and it’s super uncomfortable. I read somewhere where the recent boom of “millennial pink” is because of a lot of people getting over their internalized sexism and realizing pink is a super awesome color, and there’s a bunch that we’re still working through, so I don’t know. It feels uncomfortable to pick up a book that says it has a strong female character only to find that it literally only ever means non-feminine. And it’s even more uncomfortable because I lean more towards femme, and there’s a reason why I didn’t wear dresses or skirts for literally YEARS, because little 10-16 year old me associated being feminine with being weak. Did I ever tell you that I had a hedgehog for five-ish years? They’re super adorable but they’re not the most…low-maintenance of pets. They can die because they slept too long. I. KNOW. I was so confused too. 😂 It’s total contemporary (and it’s so freaking good it actually made me tear up, Aine, I don’t even know myself anymore). Is it bad that I’ve never read The Raven Cycle? The covers are so pretty, and I kind of want to read them because you talk about them so much. I’m adding them to my TBR list right now. Also, your dog is the cutest thing ever! IT IS PRETTY BAD. I ONLY SPEND ALL THIS TIME TALKING ABOUT IT, AJ. YOU WANT TO MAKE ME CRY??? Oh I understand the obsession so well, I haven’t read the Raven Boys yet (so sorry I want to and it’s on my tbr) but I’ll obsess with books to an unhealthy level. My favorite series is probably Percy Jackson\Heroes of Olympus but my favorite author is Marie Lu, who no one at my school has heard of. And yes why not talk about strong male characters too? And yeah living in a library and just reading and not dealing with people would be great (I’m not antisocial). Oh and I’m super excited for your book and I don’t even read contemporary, do you know if it will be available in America? As long as it’s on your TBR ALL IS FORGIVEN DON’T WORRY. 😂😂 Just kidding, no pressure haha. And ohh I love the Riordan books too!! I think we should just skip saying “strong” altogether and say complex!?? Because all characters should be complex! And aw, thank you so much that means a lot to me that you want to read my book! It’s not being published in the USA yet, but i’ll be available on sites like Bookdepository which as free postage! 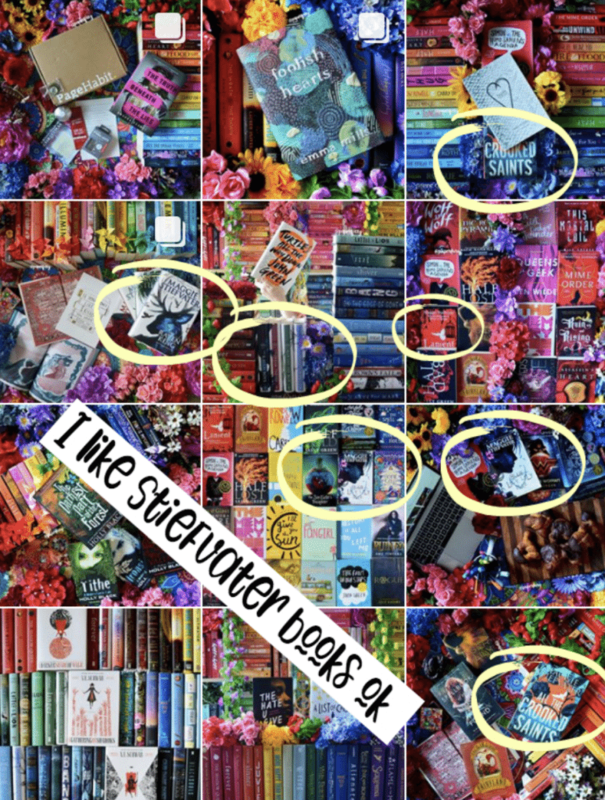 Hmmm… yup, your love for Stiefvater’s books has definitely been subtle! 😂 I’ve actually checked out the Raven Cycle series once from the library, but I had to return them before I got around to reading them. 😶 Seeing how passionate your are about Stiefvater’s books makes me really curious and excited to read them, though! When I get around to reading them, I’ll notify you and you can put me on the list of people you’ve convinced to read Stiefvater’s books… wait, do you have a list? Or has that list gotten too long that you’ve given up in updating it? 😂 I enjoyed reading our post! Was this tag created for you??? Because I think yes. I THOUGHT THAT REREADING THE RAVEN BOYS WOULD CAUSE ME TO SEE FLAWS IN IT, BUT NO, IT JUST MADE MY LOVE FOR IT MORE INTENSE. WHAT THE HECK. EVERY REREAD MAKES IT BETTER. THIS IS FACT. Hi Cait! I really should read the Raven Cycle omg. I would love to see a post focused on the brainstorming/coming up with ideas part of writing, because I’d love to start writing but I have no idea what I want to write about. I JUST got back into “The Raven Cycle” after having to put it aside because of #lifeissues this summer and . . . WHOAAAAAAAAAAAAAAAAAA. I can’t get over what I just read. It’s that good. I love Stiefvater’s writing and I love her characters and I love her worldbuilding and I love everything, basically. But I also adore "Scorpio Races" and "All the Crooked Saints" so it's super hard to pick a single favorite book here??? Why is life such a struggle. Why. THIS MAKES ME SO HAPPY I CAN’T EVEN SAY. AHHHHH. *flails for 9000 years* Also Naoh is adorable and such a Hufflepuff and so smol and precious and how on earth is it even possible to feel so much for those boys and Blue and Fox Way and like…everything!?? I FREAKING LOVE IT ALL. THERE IS NOTHING I LOVE MORE. 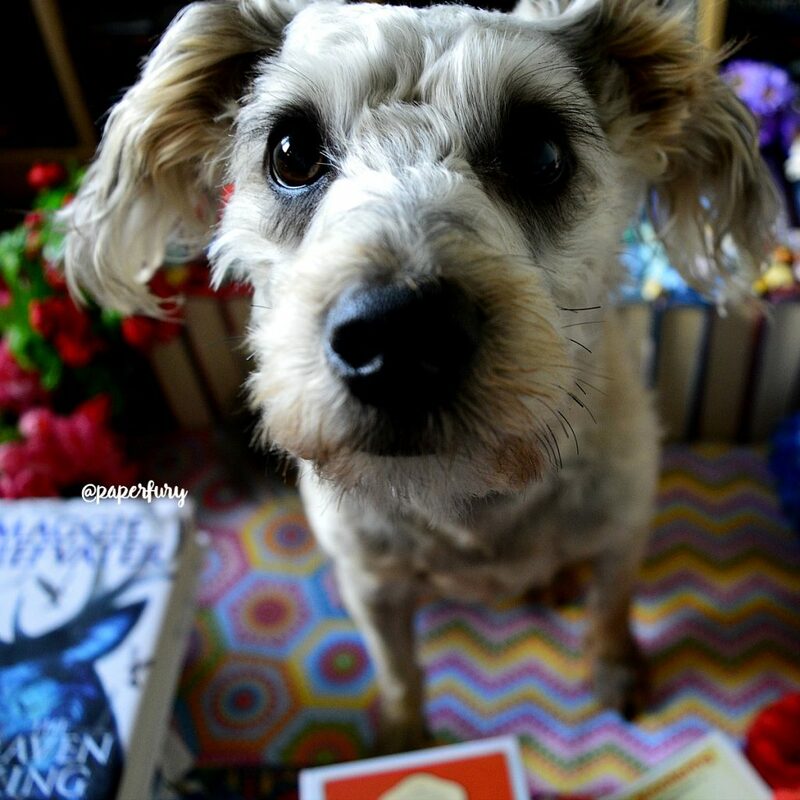 DARES ASIDE THO, I actually read the Raven Cycle solely because of your shouting about it and lemme tell you, there is at least one smol person who appreciates that. I can’t write in verse omg.😂I barely ever read poetry or anything like that hahaha. And omg I’m SO glad I convinced you to read the Raven Cycle. My work here is done. I’ve only read the first two The Raven Cycle books from Stiefvater, and I really need to finish it!! Your puppy is so cute!!! Is he a Schnauzer? I want to have a hedgehog as a pet! They are so cute omg!!! YOU DO SO MUCH. *flails wildly in that corner* And yes he’s a Schnazuer x poodle and basically so opinionated and highly strung hahaha. This was such a fun tag to read! And I definitely agree about “strong female character.” That reminds me of a thriller I read last year. Even in a paragraph where it was very clear what the gender of the person was because of all the personal pronouns, the author would always write “FEMALE security guard” or “FEMALE cop.” But he never wrote “male security guard.” It made me so mad! Aww thank you! I’m glad you liked it! Also that thriller sounds entirely awful ugh. Why is it so hard for people to write women as HUMANS?!? It shouldn’t be such a challenge tbh. 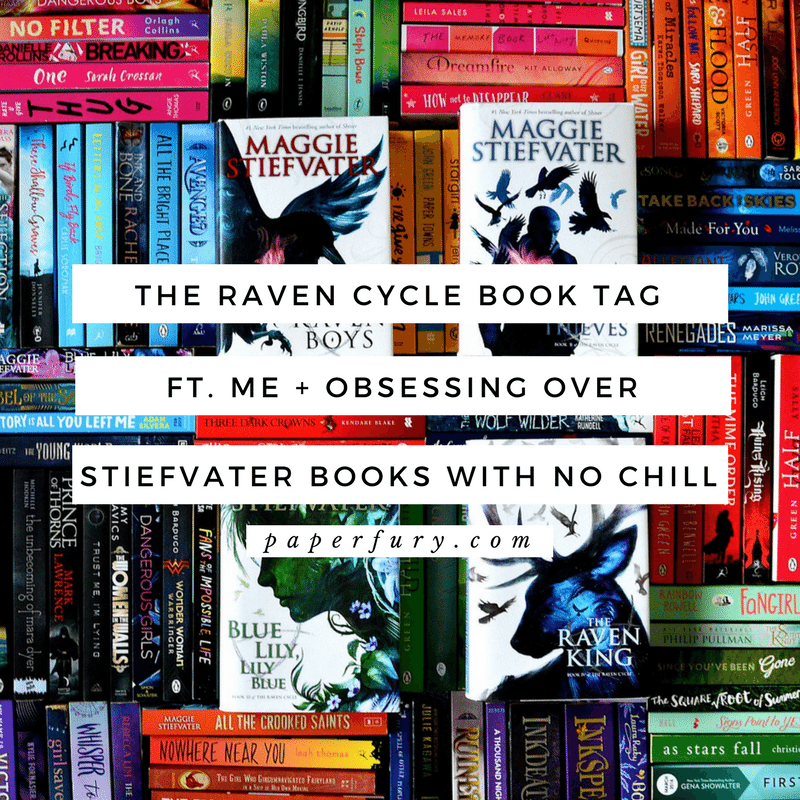 I haven’t read any of the raven cycle books or any books written by Stiefvater but I know you gush over her books in like 99% of your blog posts.lol. would definitely read her books when I get the chance. 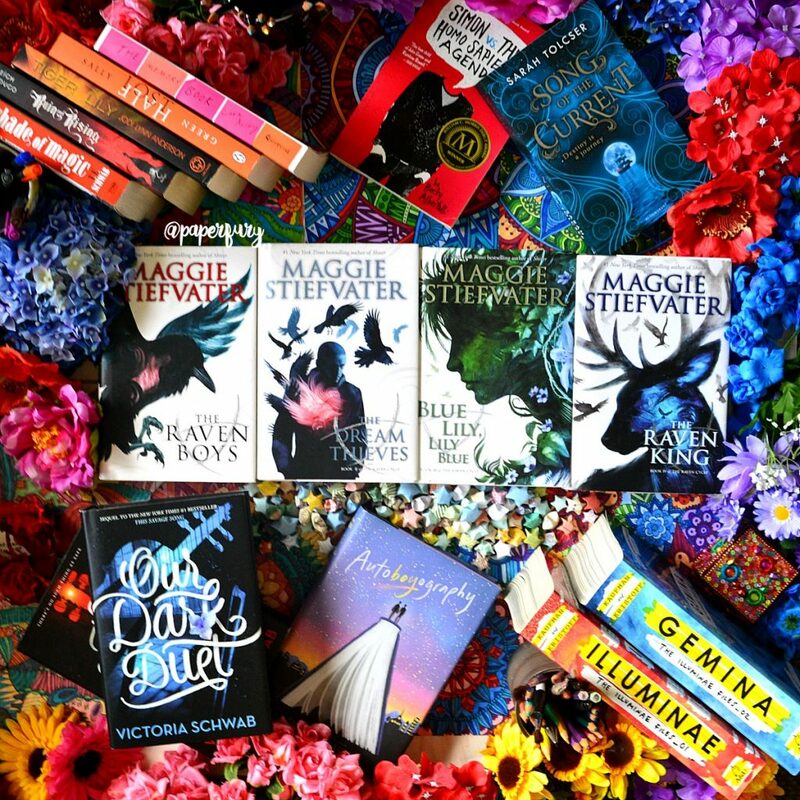 And I think the raven cycle book tag was made by MichEllisLife , a booktuber, just in case you were wondering…..
Congrats on your book, A thousand perfect notes,saw the book cover and I was blown away, so gorgeous. *screaming softly* I will just keep recommending them until you do! 😂 Haha! And ohh, I should look up the origins of the tag maker so I can link to it! Also THANK YOU about my cover! I’m so happy with everyone’s reaction to it! I can’t say that I really have a favourite author. There are authors that I like, but most of them have also written books that I’m not that crazy about, so it’s hard to make a definitive statement. Diana Wynne Jones, Charles de Lint, and Gail Carson Levine probably come close to favourites, since I’ve read and liked more of their books than those from many other authors. It doesn’t hurt that they all are/were prolific! Ahhhh I hope you like The Scorpio Races. 😍😍 And it’s really hard to pick like that ONE favourite author I know. 😂 It’s such a mean and stressful question. Like I still have other authors I adore absolutely and completely hahah, but Stiefvater has just some sort of magic that’s really captured my heart. And I think my favourite Stiefvater book is probably The Scorpio Races… I enjoyed The Raven Cycle, but something about The Scorpio Races just captured my heart… I fell so in love with the characters, and… I don’t know honestly. I think I liked the November cakes to tell the truth. HE IS CUTE!! EVEN IF HE’S SLIGHTLY EVIL! !😂 And I honestly think The Scorpio Races is so freaking perfect my heart actually aches with love for it. I keep meaning to reread TRC and now you’ve made me decide to start it by the end of January. My favourite Stiefvater at the moment has to be ‘The Scorpio Races’ as it’s just perfect! Now, that we've got that out of the way, I'm not sure if I could do a post like this as most of the Physical Literary novels I read are kinda starting to blur together, nothing is really standing out for me. Oh well. I'll let you know if that changes and/or I change my mind and I'll link you back to my own tag post. I love Maggie, and this series, and your tag answers, and your love for all of this so very much. Please never change because your fangirling posts are MY FAVES. An empty city, now that’s a vision. Also, your constant featuring and squealing over The Raven Boys is like half the reason I read your blog and love your Instagram (jokes, jokes…like 20 percent). Also, villains? Please tell me you have an entire post about them. I love villains, the worse the better. Especially surprise villains. As for strong female characters, you’re so right. It’s like when people say “man bun” or something…like, it’s just a bun. No man terminology needed. Also, are you sure your dog isn’t just a cat soul in the guise of a dog body? Awesome post, Cait! Isn’t it just?! So many books, so little interruptions! (*wherein it is apparent that Cait is such an introverted hermit*😂😂) AHEM. Also I’m like 500% pleased that my Raven Boys shouting has paid off because omg I am only here on this earth to convert everyone to reading it. Also I feel like I have done a post on villains?! AND AT THE SAME TIME I DON’T REMEMBER. I SHOULD DO IT AGAIN. A week long celebration of me. How about book dates? If you liked this book then you’ll like that book? 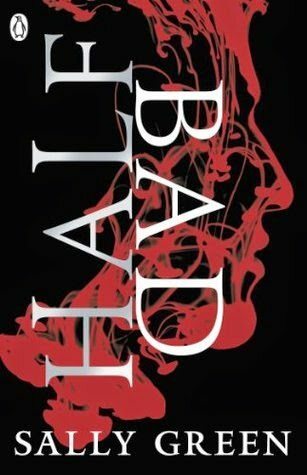 Great books with terrible characters? Weird cover editions? Those are always hilarious, cough Australian Shatter Me cough. I really enjoyed her Wolves of Mercy Falls series, apart from Sinner because that was a mess but sadly I can’t get into her writing. I’ve tried The Raven Boys before and I feel like I’m missing something deeper with her writing and I’m the only one who doesn’t understand. Is there a deeper meaning? Ohh ohhhhhhh, you can translate the books for me in a post. I will try to forgive you for your unlove of THE BEST BOOKS EVER and I think for that I deserve like 3 stickers. Maybe 4. I’m starting to think that the PR team for TRC and Stiefvater books in general is just made up of you. I picked up TRC last year after your incessant yelling (which is always much appreciated) and I FELL IN LOVE, CAIT. The Raven Cycle is my second favourite series of all time. I actually got into reading urban fantasy because of it. I also mostly want to write urban fantasy, so it’s all because of you basically. My favourite Stiefvater book is The Dream Thieves, although I haven’t read The Scorpio Races and her faerie series yet. RONAN LYNCH IS MY FAVE AND ASDFGHJKL. I would ask Glendower for time actually. It’s cliche, but there’s nothing new under the sun. Sarah J. Maas is actually my favourite author, storytelling wise. But she is hugely problematic, so I’d actually go with Maggie. “I see these little 16 year olds and I JUST WANT THEM TO GET A JACKET. TAKE A SNACK. DID YOU GET A GOOD NIGHT’S REST. EATING POPCORN IS NOT A MEAL GET SOME PROTEIN AND–” Cait, what are you loOKING OVER MY SHOULDER?? “sQUASH ONE sQUASH TWO” is forever the formatting I’m going to use for it. You just made it even more horrible (see: awesome). Well…busted. It totally is just me. I am like the entire publicity team all rolled into one little cute lollipop dipped in over-enthusiasm and I even adore Maggie Stiefvater so much I will never never never talk or tweet to her. 😂 LET ME GO LAY DOWN IN A HOLE SOMEWHERE THANKS. And fajsdklfad I’m so so so so glad you’re addicted to. My work here is DONE. I need to stop, help me Alice. RONAN IS THE BEST AND MY ABSOLUTE FAVORITE AHHHHHHHHHH!!!! #NoChill I love him SO MUCH and I’m pretty sure he’s my favorite fictional character in any book ever. As for a favorite Stiefvater book, It’s a tie between Dream Thieves and The Scorpio Races. 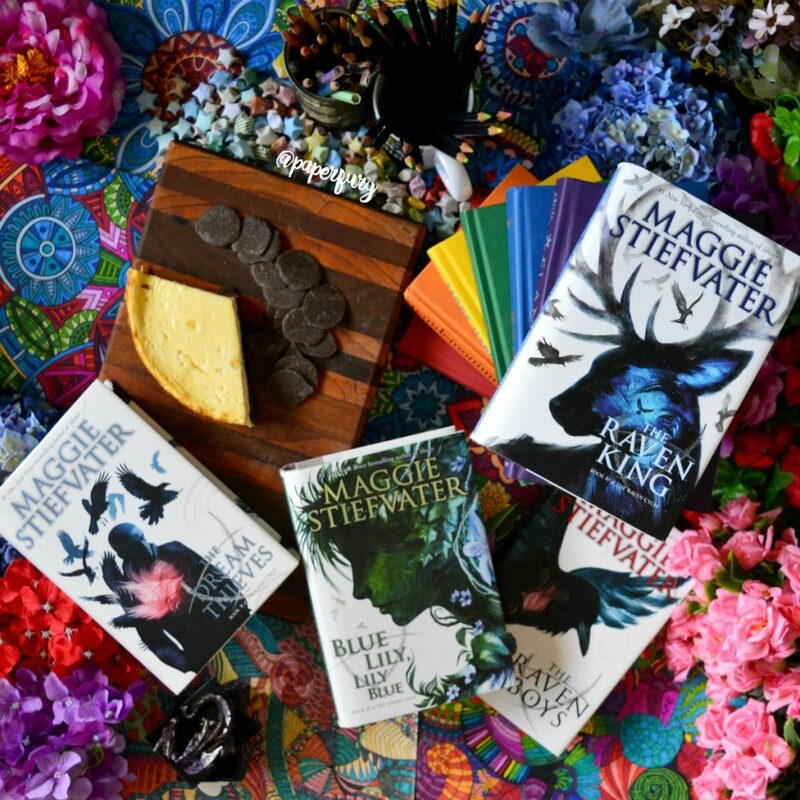 Did you see that Stiefvater is creating a special Raven Cycle book box?!? I already own all the books, but I don’t even care. I WILL BUY THEM AGAIN. TAKE ALL MY MONEY. I don’t know what I would wish Glendower for! More pie??? And it’s hard to choose a favorite author–it’s like choosing a favorite child! I LOVE YOU ALL EQUALLY (only not really). But I really can’t shut up about Cassandra Clare books. I’m in the middle of rereading The Mortal Instruments and I really just need to find other topics to talk about. Lol. afjkdlsad yes yes YES to Ronan. I love him so much and he is perfect and perfectly awful at times, but obviously still perfect. Like whY IS THE WHOLE SERIES SO GOOD. I CAN’T BREATHE. And I did!! I really want that book box. 😍 I’m hoping it’ll ship INT. I think she’s just selling the box though, right? Not the books? Ohh you have SO much stress coming.😂 BUT IT’S WORTH IT AND THE ENDING IS SO GOOD. I love Maggie Stiefvater, she’s been one of my favourite authors for a while now. But I haven’t read Crooked Saints yet because I am terrible. My favourite is Scorpio Races and I really want to reread this year because it’s been ages and it’s so beautiful. I constantly talk about Jaclyn Moriarty, to the point where she now remembers me and it’s terribly embarrassing but I love her. Honestly I want to reread The Scorpio Races every year.😍 Preferably in November haha, because why not.😂 Also that’s so cool your favourite author actually even knows you!! One of the benefits of living in Sydney is there are so many book events you basically turn into a stalker. 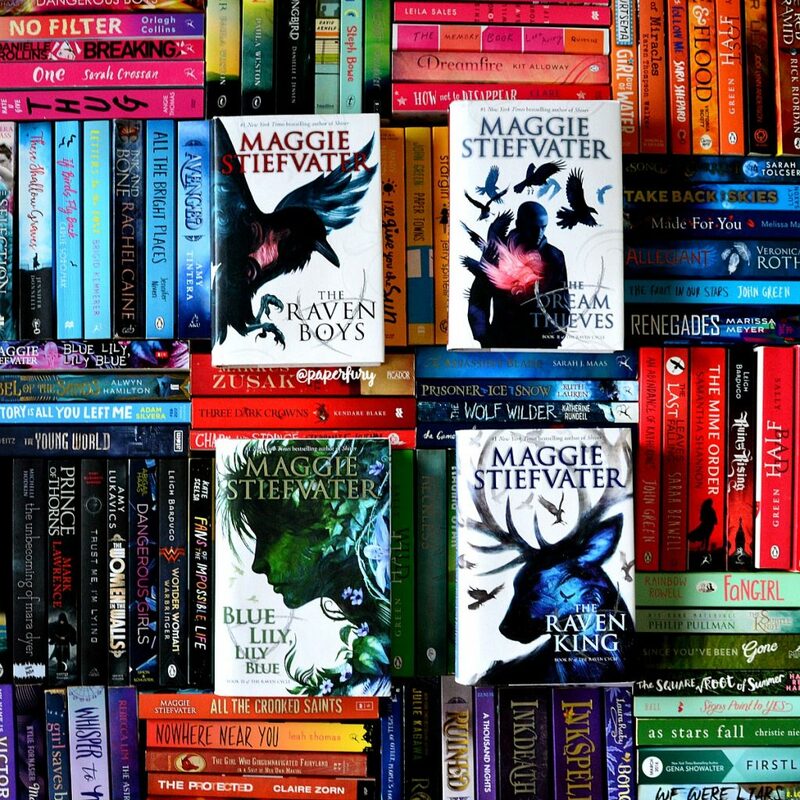 who’s your favourite Stiefvater character —> OH HOW DO I DECIDE? I love BLUE SO MUCH and Gansey IS SO PRECIOUS and ADAM AND RONAN AND NOAH and…I’ll go with gansey BECAUSE HE’S JUST SUCH A BEAUTIFUL GEM I LOVE HIM SO MUCH HE DESERVES THE WORL. 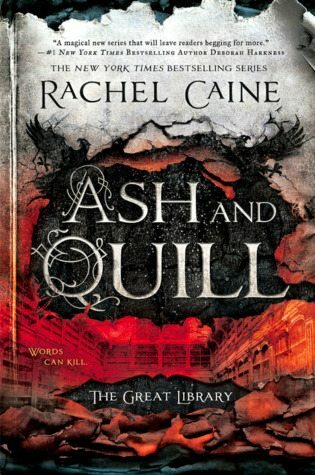 Favourite Book –> I’ve only read the Raven Cycle by her and I loved Blue Lilly Lily Blue SO MUCH. it messed me up so much??? I would wish Glendower forr A BOOKSHELF AND ENDLESS AMOUNT OF BOOKS. I mean what ELSE? is there to wish for. apart crom cake and ice creaM of course. I’m not sure I have a FAVOURITE author but I LOVE LEIGH BARDUGO SHE IS QUEEN and MARIE LU andddd Amanda Foody (I AM WILD FAN DID YOU NOT GUESS AHAHHA) and V.E SCHWAB!! Look at all these women taking over the world. It is monty. Of course he stands out. Your dog looks so cute though. He does not look like an unaffectionate dog. ‘but you can’t look away from this trainwreck’ So true. Hahahaha why hello Cait. I don’t know if you recall (its sort of hard to forget since I’m shouting this to you in every post I comment on ever including your most recent one 😂), but you are the evil person who introduced me to The Raven Boys. It was So AmaZinG and also the only Steifvater series I’ve read. Whoops. Should probably get into reading the others.. And can I just say that NOAH is my favourite hand down. I just couldn’t even deal when he —SPOILER ALERT ASDFGHJK— died. I died inside too. I stg I still haven’t recovered. I just can’t he’s the best ghost ever and I’m just overflowing with hufflepuff appreciation. And as for Glendower, I think the answer’s obvious here. I actually have this super detailed wish, but the gist is basically that I’d want to jump into any book and then back out again and be able to interact with the characters and also not die because yikes 99% of YA is basically just people going around dying willy nilly. I’M REALLY GLAD I AM THE EVIL PERSON WHO MADE YOUR LIFE 500 X BETTER WITH THE RAVEN BOYS. YOU’RE WELCOME. I’M HERE TO BE AMAZING. And also you should toootally read the others!! Especially The Scorpio Races ajfdaksld it’s the best thing and I have fEELINGS. Lemony Snicket is amazing! I was actually devastated when I Found it out it wasn’t his real name. 😂 How dare he ruin my childhood by having a normal name, ew. I (ashamedly) haven’t read The Raven Cycle yet, but since reading your blog that’s all I want to do. Anyways, I absolutely adore this tag! Another AMAZING post, Cait! The Raven Cycle is one of those series that never gets old, and I love you much you love it! My favorite character would have to be Adam, mainly because I can kind of relate to his home life. Not to the same extent, but there are similarities for sure. There are such a thing as rock cakes! !😂 Edibles ones, I promise ah hahha. I’m commenting with the hopes that this won’t be overlooked but whatEver. I want to say just how much I share your passion for the Raven Cycle. I have rarely really seen much hype about it anywhere on youtube and other places and it seems like a grossly overlooked gem. 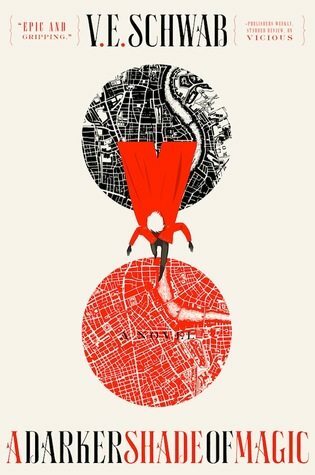 I think that the writing, the articulation of a character driven plot, and Ronan (cough cough) are all so unique and just unimaginably well oiled and polished. I don’t know if this will be any kind of surprise to you but the new dreamers trilogy Maggie is coming out with specifically about Ronan has me absolutely hyped and I’m so excited about it. I feel like, after rereading the series multiple times, that with the depth she put into Ronan’s character development and his multi-dimensional personality (not to say that the other characters aren’t multi-dimensional) makes me feel as if she wrote the series around the idea of him. But aAAH that series gets me shook. Also Ronan and Adam are best couple thank you very much and woo sorry for rambling. I know it doesn’t seem like I get al asdfghj about this series but t r u s t me I’m more hype than lowercase letters and periods. Ah yyayyy! It’s always the best thing ever to meet a fellow fan!! 😉 I tend to feel like The Raven Cycle is pretty hyped on instagram?! But maybe I just follow the right people. I don’t do booktube at all, but it’s just the bessst series and I love it so much and I’m DYING with excitement for the Ronan books. I know Maggie Stiefvater only just turned in the first draft, but I hope we get a release date to count down to soon.